Painter and composer who was a leader of the expressionist movement in German art and poetry at the beginning of the 20th century and labeled as a creator of degenerate art by the Nazi Party. He was known for developing atonality, even though he loathed the very word. He took piano lessons from his mother, but was largely self-taught in composition. He was revolutionary in that the Romantic styles of Brahms and Wagner had traditionally been in opposition to each other, but he found a way to harmonize the two, literally and figuratively. He pioneered the twelve-tone technique and coined the term developing variation. Furthermore, he pioneered the development of motifs without first establishing a centralized melodic idea. He married Mathilde Zemlinsky in 1901. 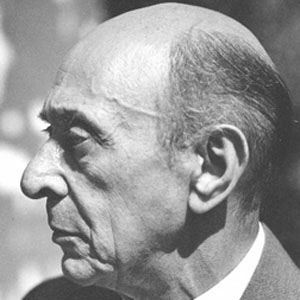 He changed the spelling of his surname from Schönberg to Schoenberg after relocating to the United States in 1934. He taught many notable composers, including John Cage.